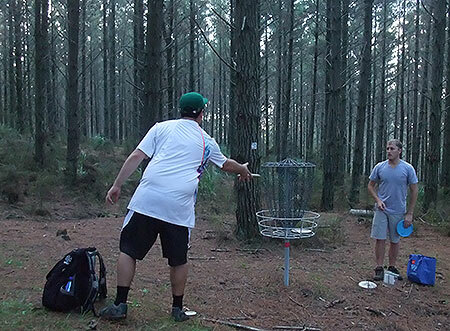 The 2014 Woodhill Open Disc Golf Championships. In the middle of June, a touch shy of the shortest day yet anyone who attended may have been excused for thinking it was middle of spring! 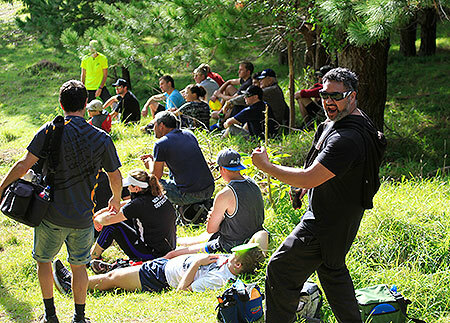 All the elements of a good tourny were well represented - beer, wine, coffee, sunshine (I think Disc Golf Bob was spotted momentarily with his shirt off), a keen field, some seriously cool holes and yes, even a seemingly un-aceable Ace. Throw in a gourmet burger and a keg for lunch and you got yourself a damn good time. Pre registration was well pumped and those players that did so were well rewarded with a players pack worth more than the $20 rego. TD Haydn had nailed down a few sponsors to throw some goodies our way. 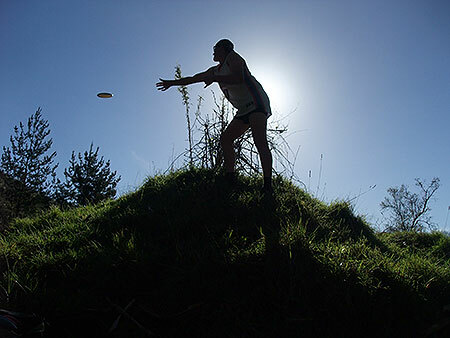 Hallertau Brewery, Matua Wines, Hukkit Clothing, Innova, discshop.co.nz and Vortica Sport all played along (excuse the pun) to make the weekend a winning one for everyone. 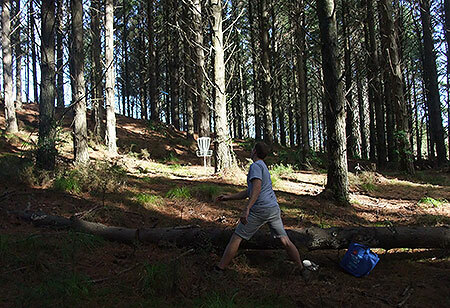 The disc golf itself was traditional Woodhill style with very few people coming away from round 1 unscathed from the Tough front 9 in the Tree lined fairways behind the busy Mountain Bike Carpark. 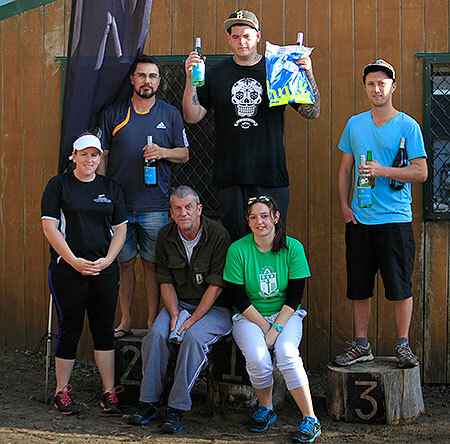 The course remained virtually unchanged from the "kicked many asses" 2013 Nationals Course. Haydn had upgraded the B Tees for the ladies in the Tourny with proper markings, leaving behind a permanent short techy 18 hole course to hone players skills once the event had been and gone. With erratic scores coming from the whole field it was obvious that this event was going to go the full 3 rounds. Blair Joines scored his consistent game and came out on top after round 1 with a 55. Following closely on his heels were the Usual suspects of Jackson Sullivan, Brad Muir and Dean Marshall all shooting 56. The gourmet burgers and the keg beer worked wonders on some of the players as the afternoon rounds were (in general of course) better. A cracker comeback from the TD shooting a 57 despite shooting a mumble mumble in the morning. Now heres where it got interesting. With 4 holes to play in the 2nd round, Jackson who was now leading at this stage started feeling unwell and despite finishing his round to come out on top, was taken away in an Ambulance. The rest of the night was spent in the hospital while the rest of us went to the Hallertau for the AGM and more beer..crikey! Bright and early we were all back and back from the dead Jackson was there to shoot another killer (see what I did there) round to be sitting in the top spot after round 3. To show the toughness of the course only two players managed a par 54 round the whole weekend. 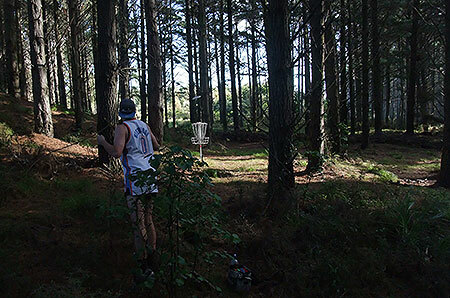 Dean Marshall from Tauranga and Abe Hartley from Levin (with a cracker ACE on the seemingly un-aceable hole 10). Before the SUper 6 we had a driving demonstration in the Hukkit longest drive comp which was a measure up between eventual winner Brady (USA via Wellington), and local big arm Lance Hartwell both throwing 150m+. Super 6 (7 qualified) looked something like this: Jackson, Dean, Brad, Blair, Dean, Logan P, Nigel, Gemma. 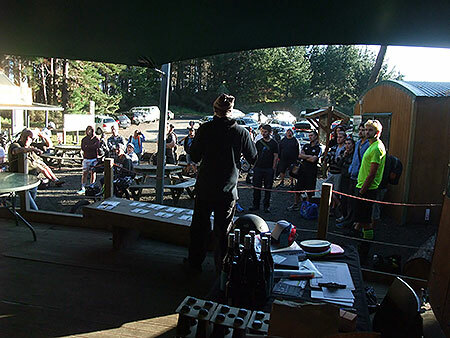 The super 6 holes were never going to be the easy ones and for those that know the course were 1, 2, 7, 8, 10, 18 (but extended to the practice basket by the busy carpark for mondo Disc Golf exposure). Every hole the positions changed with the final hole still not a certainty for anyone.. One of the best super 6's in a while, congratulations to Levin's Jackson Sullivan who held his nerve to take the Open and Overall win. Town Crier- TD Haydz in full cry ahead of the opening round for the weekend. Up and Round - Levin's Lawton Williams concentrates on the sun lit basket. 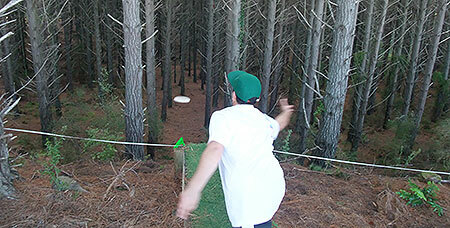 Air Force One - RNZRAF Disc Golfer Ace Lindsay surrounded by timber. Good shot or good luck - Both came into play from the elevated Tee on 6. Tee shirts in June - Lawton Williams putts out watched by playing partner Geoffrey Nijhuis. Woodhill! - Ace Lindsay enjoys the wide open spaces of the back 9. Listen carefully .. I'll say this only once. 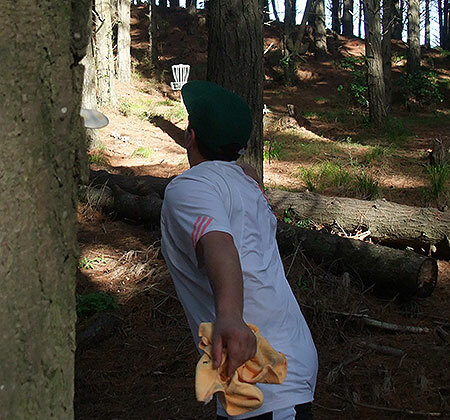 Used to the trees - Rotorua Disc Golfer Geoffrey Nijhuis sends his shot to the basket. 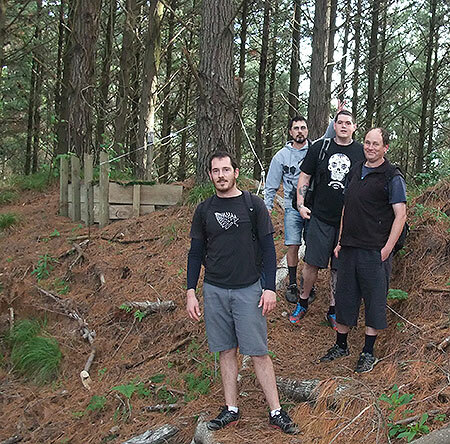 Contenders - Brad Muir, Dean Marshall, Jacko Sullivan & Blair Joines make their way off Tee 3. Making It Look Easy - National Park golfer Des Cooper finds a gap. C'mon, Ace!- George Huhu rarks up the Super 6 gallery. 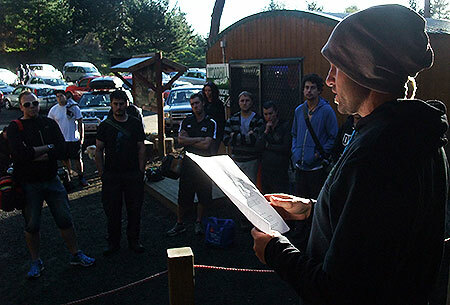 Attention All Golfers - TD Haydz runs through the rules from the Pro-shop deck. Repeat Image - There is a gap there .. somewhere. Lawton Williams hoping to avoid timber. The Prez - Nigel Hailstone with lips in hand. 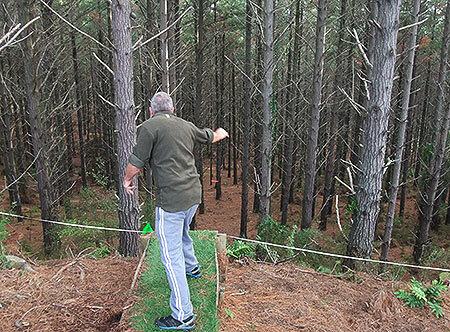 Thought Process - There is more gaps than trees, so this can't be that hard .. surly thinks Rotorua Disc Golfer Andy George. Putting Out - Shane Sullivan putts out 10. San Francisco style. American golfer resident in Wellington Brady Keuch plays outta the rough. Mist Skimmer - Mountain Man Des Cooper at home in the Sunday morning fog. 35 Ziz Grey W 67 71 dnf dnf dnf.